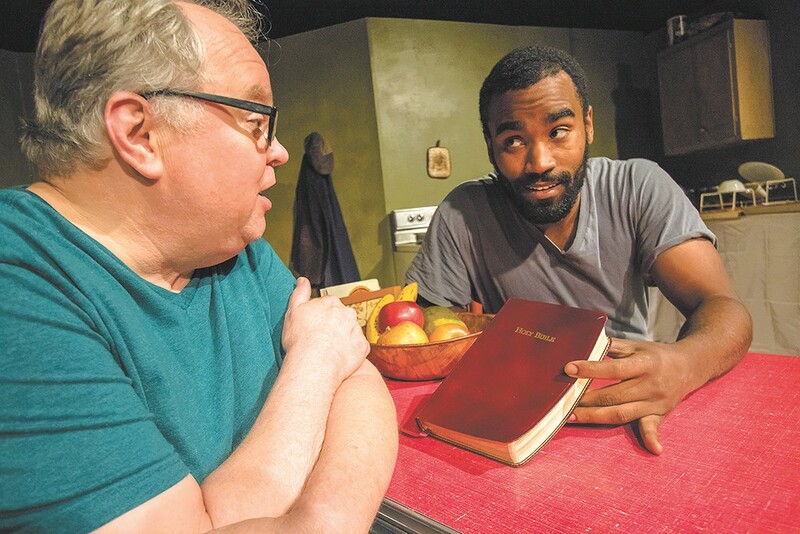 Ron Ford (left) and Edward Casto in Stage Left's The Sunset Limited. T he two characters in Cormac McCarthy's The Sunset Limited — one of only two plays from the author of All the Pretty Horses, No Country for Old Men and The Road — are all but nameless. On the page they're called simply White and Black. In one sense, those are little more than labels, narrow and unsubtle references to the color of the characters' skin. White, in keeping with type, is a university professor who digests conversational speech and spits it back in terms like "dialectic" and "homily." He's reached a point of suicidal, nihilistic despair because "Western Civilization ... went up in smoke in the chimneys of Dachau." Black, an evangelical Christian and ex-con, seems to regard this as a rarefied form of suffering, but his self- (he might insist God-) appointed role as a samaritan has nevertheless led him to bring White back to his ghetto apartment for ministry after pulling him out of the path of an oncoming train. Listen to their colloquy for a moment, and it becomes clear that those designations hold a deliberate irony — or at least a deliberate ambiguity. Black wants nothing more than to help White find the goodness and light of the eternal life promised by Jesus. White finds the very notion abhorrent and "yearn(s) for the darkness" that he hopes death will bring. As an almost necessary result, their conversation around Black's kitchen table bears out the same futility that White finds in life itself. This is Cormac McCarthy, after all. Who would expect him to allow redemption to come easily? Philosophically and theologically, McCarthy's play isn't much more exploratory than a wee-hours freshman dorm conversation. As a kind of intellectual exercise in which you can sense the author's hand at work behind the characters' artificially tidy, albeit poetic rhetoric, The Sunset Limited has loose parallels to Wittenberg, which ran here at Stage Left earlier this year. Fittingly, it's Martin Luther who White invokes at one point: "Ich kann nicht anders," he mutters to Black, indifferent as to whether or not the reference hits home. He can't be anything other than what he is. Black's role is the more challenging of the two, and Edward Casto slips into the dialogue's contrapuntal slang (from time to time McCarthy's "you is" subject/verb mismatch is inauthentically clunky) and handles the emotional transformation from — at the risk of putting it too reductively — hustler to hustled with aplomb. He occasionally, and understandably, buckles under the colossal line load, though he recovers well enough. More disappointing was his halting delivery of the pivotal "jailhouse story." Its lack of menace was exacerbated by the decision to bathe the brutal anecdote in red light. Better to leave the overt visual cues aside and let the story speak for itself. Ron Ford's White is suitably tired, frumpy and resigned, only breaking into rage in the play's final resolute moments. His dynamic with Casto rings true and natural, as if the pair have a solid offstage rapport as well. Throughout all this, Jennie Oliver's direction is appropriately light, allowing the characters to shift around the clean but dim, dated space of Black's apartment without it ever seeming like movement for its own sake. This is no small feat, as the absence of any meaningful physical action in The Sunset Limited puts it squarely in the realm of radio play.